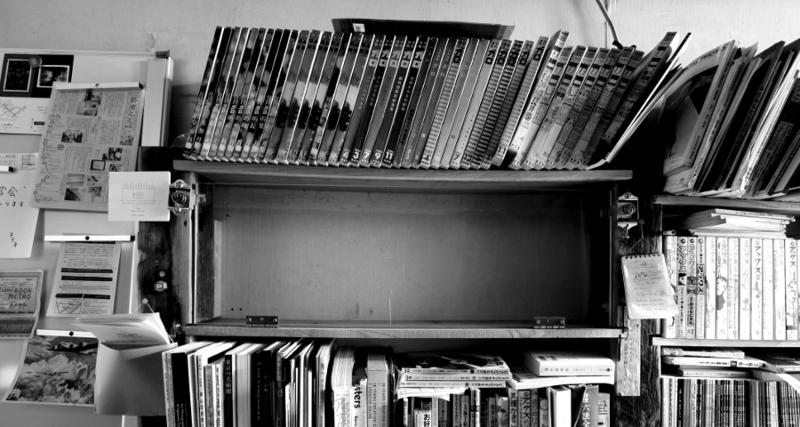 Founded in 2010, TANA Gallery Bookshelf is an alternative space situated in a bookshelf in Bigakko in Kanda, Tokyo, an old private art school acclaimed for its dialogue-based, liberal arts education by leading artists and practitioners in various fields since its inauguration in 1969. With a modest space that measures 85/30/15 centimeters on the top-left corner of the bookshelf in a narrow corridor, we collaborate with a range of artists to present site-specific exhibitions while organizing projects in other, usually unusual places as well. Initially conceived as a micro-architectural answer to French philosopher Henri Lefebvre's idea "new social relations demand a new space, and vice-versa," the gallery offers a set of unique spatial conditions for artists and visitors to variously improvise social fabric through the exhibition, as a node of static/ephemeral vernacularities already there and new human and non-human relations brought in there through each exhibition, i.e., each temporal spatial construction as what the French urbanist called "production of space." Although often described "small" (or even counterfactually praised "smallest in Tokyo"), we never try to promote the idea of smallness itself as easily associated with Tokyo-ness or reactive anti-establishment politics. Instead, the venue is simply designed to be "just enough" to expose the particularities of a given space, which can be found everywhere but loosely disregarded in bigger places, and to encourage artists to revisit their own creative identity and enact it into another, different but coherent form. Our mission is to maintain a minimum yet actual site for free aesthetic imagination not bound to two major sources of confusion in Japan - plausible marketism ("plausible" because contemporary art market in Japan is too weak to count seriously or to stage ideological struggles against) and, more importantly, what can be called curatorial functionalism, which tends to rush down to novelty and zeitgeisty timeliness alone and consume the complexity and indeterminacy of ongoing art practices into pre-fabricated contexts and set-phrases too easily (which often results from the delayed yet uniquely orchestrated collective consumption of well-promoted global trends). With full respect to the critically-negotiated autonomy of art and the socio-political potentials of aesthetics as such, we encourage artists to stay open to individual thought and inspiration, find its place in reality, and share its fruits in society. - The exhibition venue is usually unmanned, just on display in the school building during its opening hours. If you want attendance of the exhibiting artist or our gallery staff, please join opening reception or related events, or contact us in advance. - The gallery does not represent artists. If necessary, please find their contact information from each exhibition detail.